Why am I saying Flat when it’s got a couple of degrees rise right at the start? This chart is the “Change of temperature per year” or dT/yr and the running total of that over time: dT. This is ALL data for North America in the GHCN data set. ( The February 2010 vintage download). Those first few years are interesting, but it is only one thermometer for many years, eventually becoming 2. You have to get to about 1800 or 1825 to get into a decent number, like 20. So now look at that chart again and notice that the dT line is at about zero near 1825. We’ve gone nowhere in almost 200 years. You can see “Eighteen Hundred And Froze To Death” as a down spike after a major volcanic event. You can see some rise out of the Little Ice Age. You can even see a hot 1934 as recorded in our history. Notice also the relatively cold period of 1951 to 1980 where GIStemp put their baseline period. The entire Industrial Revolution is substantially “Flat with a ripple”. And that is what I mean by “Flat” in North America. (We will see a much prettier, but harder to read, version at the very bottom of this posting, that starts time in 1825 just to show how flat it has been). In looking at North America, the dT/dt report is rather interesting. I’ve looked at all the countries of the world as the “tabular reports” (since it takes about a minute to make the table and it takes me about 10 minutes to make a graph out of it, if I’m lucky. It’s much faster for me to screen the tables). Overall, North America is not warming, but there are some parts that do have a “warming signature”. But that “signature” is very oddly distributed. Some countries have it, some countries don’t. And some countries are just dropped on the floor. I’m going to, for now, just list the countries that are “flat then dropped” in the tables. I could make relatively flat graphs out of these, but what’s the point? They get ‘cut off’ a decade or two in the past and “Global Warming” true believers will simply assert they must be warming even if we have no data. After some more “interesting bits” are explored, I may make a posting with graphs of these guys. For now, you will just have to “trust me” that they are more or less flat when I’m looking at the numbers. The end years are approximations as things sometimes get large data dropouts just before the data ends, and it often ends at an odd month of the year. Countries with the word “NULL” are in the GHCN Country index file, but have NO data. 417  Saint Kitts and Nevis, '71-80 only. This leaves some countries with data, but first, just notice that these “cutoff” dates matter. On those dates, “nearby” countries up to 1000 km away can provide “in-fill” data for any missing data in GIStemp. Then, in a later step, a “grid / box” can reach up to 1200 km and be filled in by whatever it finds. While the ‘relationshiip’ will have been determined by the 1951-1980 baseline, the stuff filled in will be based on whatever is happening now. And those are NOT always the same relationship. 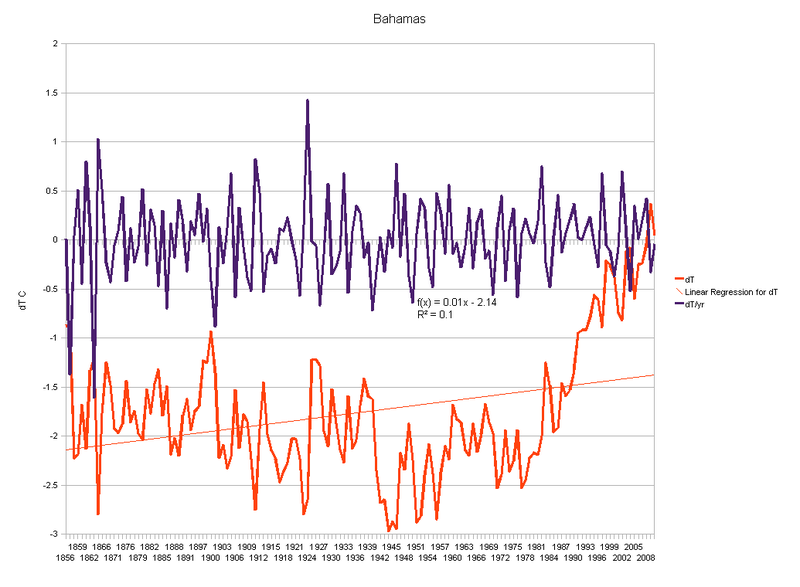 where Bermuda was shown to be quite flat, until it ended in 1995, and where we saw that The Bahamas has a ‘hockey stick’ of about 1.5 C from a change of “Duplicate Number” Flag in 1990. (I’d been calling this Mod Flag, but I’m swapping over to what NCDC has in their docs). So guess what will happen to all those places that were flat right up until the moment they were dropped? 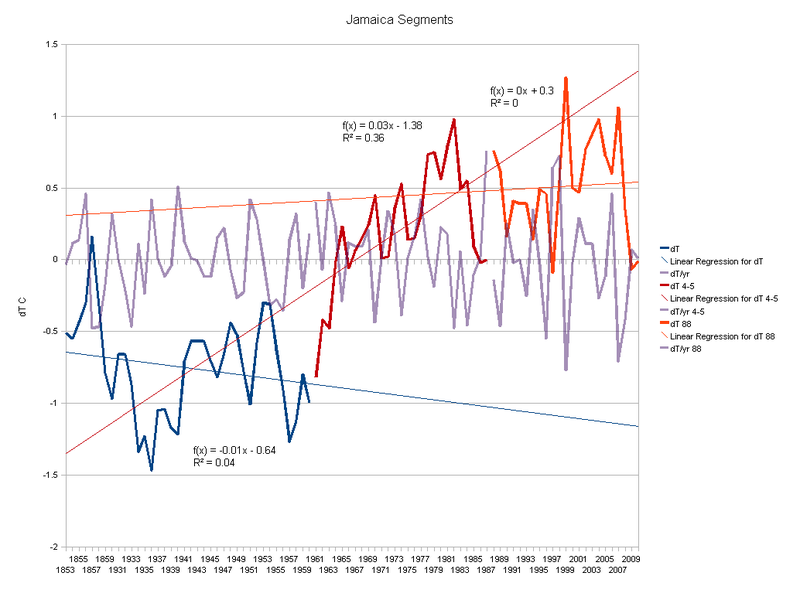 So even though Jamaica ends up, more or less, back where it started at the beginning of it’s series, the “dropped” places will be filled in with the warming trends from the bottom of the Jamaica baseline period (1951-1980) and The Bahamas Hockey Stick. So for this reason, I’ve taken to calling this process “The Reveal”. In a magic act, there are typically 3 steps. There is The Show (or the distractor). This is the “shoving swords into boxes” or the “Put the pretty girl in the box on the table over air”. Then there is “The Trick”. That is tapping the button with your toe that opens the trap door she exits through; or it’s the slanted mirror that makes it look like she is where the swords will pass, but she is really in the “hide” behind that point. The final step is “The Reveal” where you dramatically “open the box and find she disappeared” or “open the door and find she has no sword cuts”. Basically, “The Reveal” lets you see the RESULT of the trick and makes it look like something happened, when it did not. 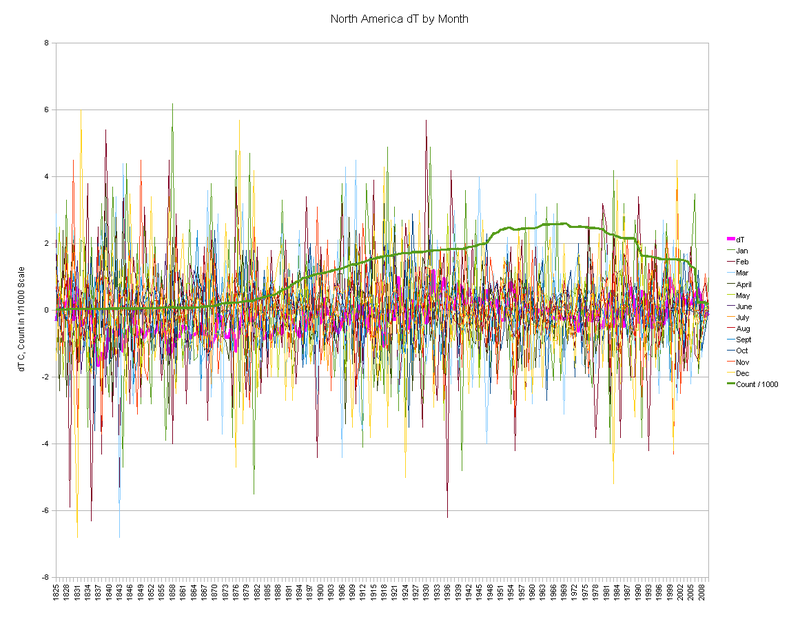 OK, there are some other countries in the area with data up to the present date and with FLAT temperature series. I’ll list them here (and as time permits, I’ll cook up graphs for them to make it more interesting). Some of these are Dead Flat (like Puerto Rico) (like Saint Pierre and Miquelon Island) and some have a more complicated but generally flat texture. Well get to all of them over the coming days to weeks. But they are more flat than anything else. For now just realize that these will be averaged in (in that oh so complicated strange “The Reference Station Method” way that GIStemp uses) with The Bahamas Hockey Stick and the other ‘warming’ countries to make a variety of not-quite hockey stick ‘trends’ in any nearby country that truncated above, and to fill in any missing months for those that still have a temperature series, but with lots of holes in it. The end result is that The Reveal (be it a truncate Reveal or a “holey data” Reveal) will end up making a rising trend any time one of those flat places starts dropping data within 1000 to 1200 km of The Trick stations. So watch these flat stations going forward to see if they develop any of: The Hockey Stick Trick, The Truncate Reveal, or The Data Dropout Reveal. ONE thermometer the whole time. Perhaps the same one originally installed years ago. Dead Flat. 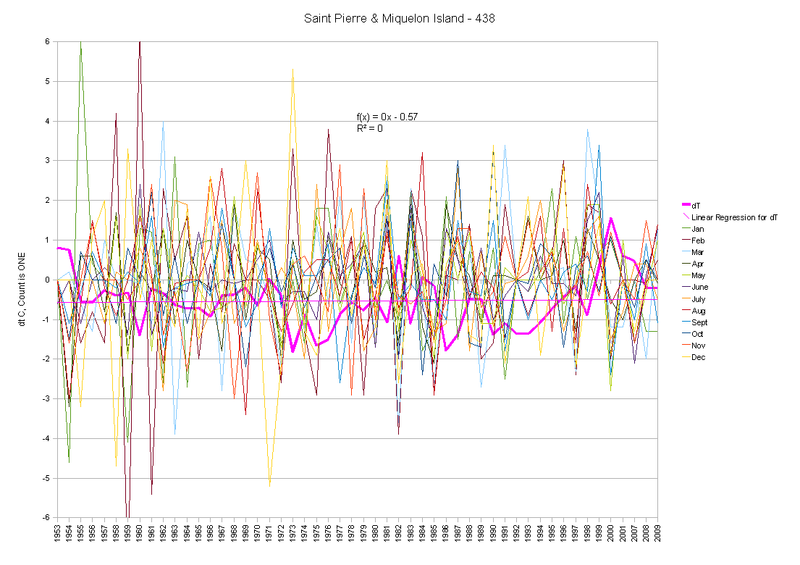 I can’t think of a better example for why it’s a bad idea to play with the instrumentation in the middle of an experiment than to compare both the Bermuda Islands and Saint Pierre & Miquelon Island to the hockey stick in The Bahamas. IMHO, The Bahamas data needs to be struck from the data set and the old thermometer (or the records from it if still being collected in Bermuda) put back in. 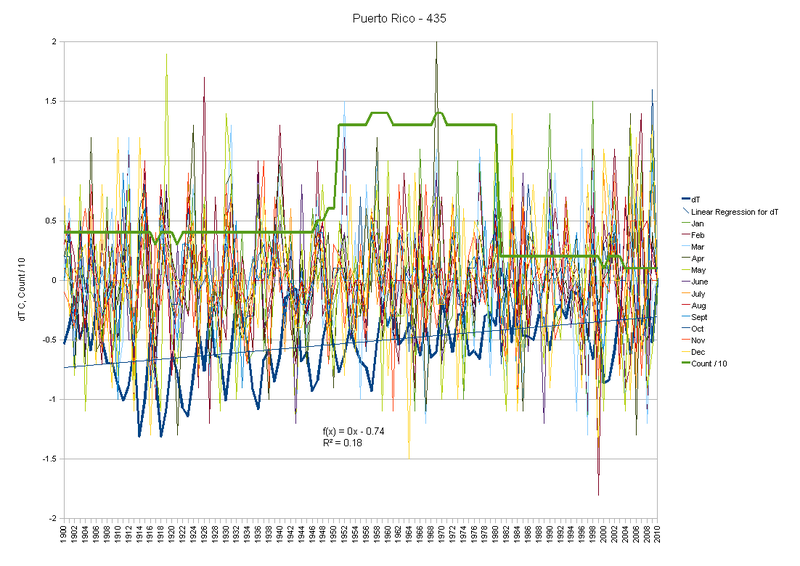 While it starts and ends at about the same place, Puerto Rico turned out to have some interesting details in the fine grained charts. First, the “Hair Graph” of the dT anomaly running total (with all those monthly anomaly dT ‘hairy details’ too ;-) Notice that after the thermometer count crashes, the monthly UP peaks reach about 1.5 C while the DOWN peaks only reach 1-1.25 C. We again have the asymmetrical peak clipping. Puerto Rico dT monthly detail with running total and trend line rising. With stable instruments we have stable trends. With instrument change we get rising trends. Even that dropping segment recently turns into a rise after The Reveal of the drop to one thermometer about 2005. 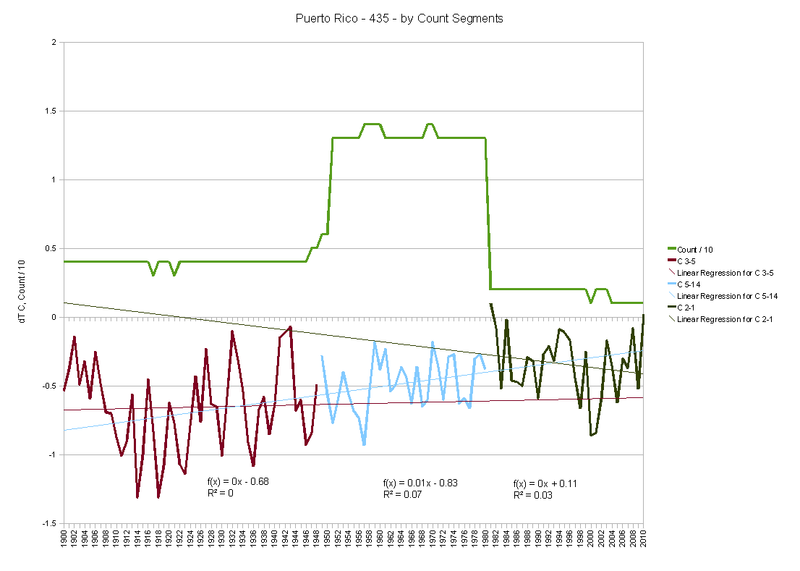 So the future for Puerto Rico is looking much warmer than the separate flat segments, or the “start to end” flatness, would imply. Just to finish out the set, here are the rest of the countries that are ‘warming’. These have pretty much universally had either a “step function” or a “hockey stick” at the point of a change of “Duplicate Number Flag”. That is, “The Splice” that makes the “The Trick” work. There are none with a smooth rise over time or even a sin wave superimposed on a rising trend as one would expect from a CO2 accumulation signature. So here we have all of 9 countries making all the “fuss”… (what fuss there is). As we work through the lists, making postings, there may end up being some country where I didn’t read the table of numbers quite right or where I end up changing what list it is in. It’s late, I’m reading little scrawls of red ink on a listing that was cribbed while looking at long lists of numbers, and I could have confused some number with another or some Guyana Giana Dominica Domincan whatever. I don’t think so, but if I stumble on one and fix it, don’t be surprised. I could also find more like Jamaica where the overall movement is small, but their is a dip in the baseline and a rise after. Now the fun thing to do is put the warming stations side by side with flat stations in the same posting (as we saw with The Bahamas and Bermuda). We’ll be doing that going forward in other postings as we work through all these places. OK, what about that Hair On Fire in Canada? In this graph there are 12 monthly anomaly series. Each of these is comparing the data in that month to the last valid data in that month and looking at the change. These are averaged together to get the dT/yr (that you see in the summary graphs elsewhere), and that dT/yr is made into a running total of all change to date as the dT line. 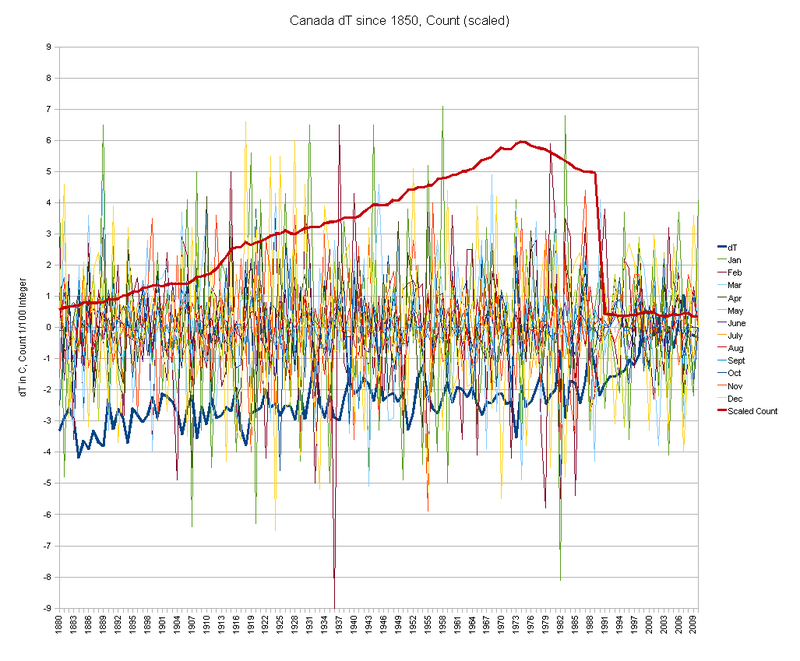 The “Count” line is the number of thermometer records from Canada and has been scaled by dividing it by 100 so as to fit in the size of this graph scale. We get about 1/2 C rise coming out of the 1880 cold end of the Little Ice Age and end up running about -2.5 C until 1988 or so (that’s when most of the more interesting new Duplicate Number Flags begin). At that point, notice how the high peaks and the low peaks for the month over month temperature changes (those lines by month) don’t reach nearly as far as they used to? We lose volatility Big Time. Peaks that used to reach +7 C now can barely get to 3.5 C. At the same time, negative peaks that used to reach -6 regularly and even -8 and -9 C on occasion are barely at -2 most of the time and only sometimes make it to the -3 and -4 C range. Further, the number of lines going significantly negative is lower than those going positive. WIth each asymmetry of those excursions, we’re cooking the history of the Canada Anomaly Total to date. It is a giant “Dig Here!” to find out what all those Duplicate Number Flags mean for Canada. It could be a change of equipment, or a change of QA process, or? But as you can see from this graph, The Anomaly Process looks at those peak clips and finds a hockey stick. There is a +2 C average Rocket Ride right after The Great Dying of Thermometers Reveal happens (and it’s about 2.5 C total from when the new Duplicate Number Flags were added to the inventory of Canada just before The Reveal). And it is vastly different in profile from before The Great Dying of Thermometers when the anomaly trend is nearly dead flat. The process consists of 3 major parts. 1) The Duplicate Number Flag Trick. SOMETHING is done that merits a new Duplicate Number flag; and the result is a thermometer series that “peak clips” but with a bias to clipping cold peaks more than hot peaks. NCDC via GHCN is the provider of this data and thus of The Duplicate Number flag Trick. These records are SPLICED onto the old Duplicate Number records at that location, and they are homogenized into anything within 1000 km that is missing data. That gives the illusion that everything is fine (but leave the tell-tail finger print of that “pinched” area in the monthly dT/yr graph at about 1989-90 (that empty white space just to the left of the plummet of thermometer count in The Great Dying of Thermometers). The monthly data are averaged into yearly averages and seasonal averages and all sorts of things, hiding the ‘pinch’. There are further Gridding and Boxing steps and even a 1200 km “reach” to blend all the data into any boxes that need some. (And merging the “hockey stick” sites with the “flat” sites). GIStemp and CRUT are “the show”. And that is how the show is done. A good magician will never tell you how The Trick is done. They will share The Showmanship. Sometimes they will share The Reveal. But never the trick. But at least now you know were to go looking and how to detect it. I will be making postings like this one for each continent and then going pack to put up the individual charts for EVERY country with data. It will take time. There are over 100 countries in the world and I can get through about 4 chart sets a day with postings if I hustle. That would be a month if I did nothing else… So a bit of patience, please. For now, though, just re-read the last few postings and see how it hangs together. 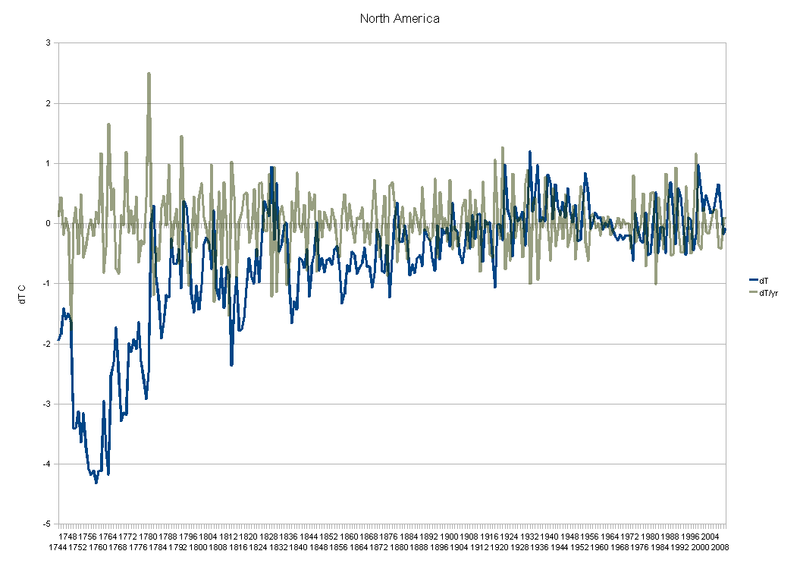 In closing, here is the “Hair Graph” for North America from 1825 to date. It’s pretty hard to read, as the lines are so dense and going nowhere much. There is a very broad coverage so many ‘interesting bits’ are being averaged in with ‘uninteresting’ making it harder to see ‘the action’ too. I had to make the dT line Hot Pink so you could see it behind the “Hair” of months, wandering back and forth about zero. 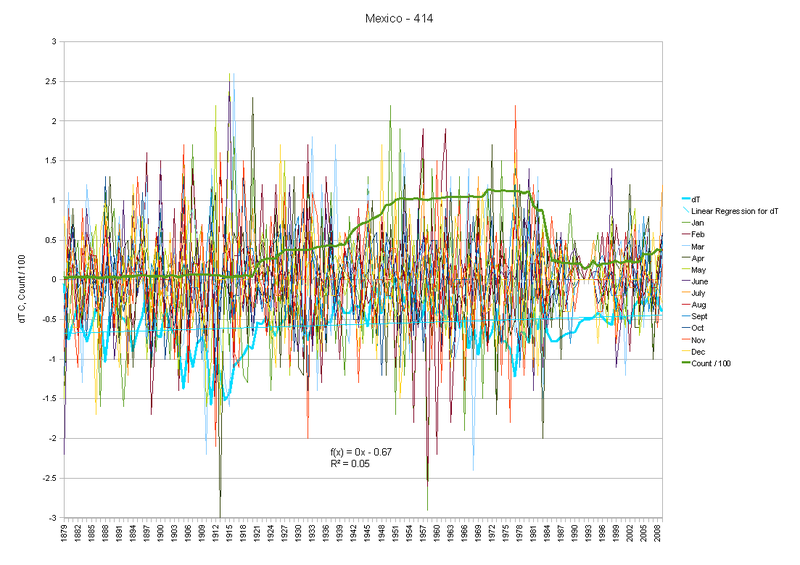 Here is the “Hair Graph” for Mexico. It has an exquisite example of the volatility “pinch” at The Splice point between Duplicate Number flags. Goes to zero and sits there in about 1992-1993. Just perfect. And you can see the ‘lift’ starting in the overlap period of the late 1980s (and inspection of the Mod flags will nail it to the exact date, but from the graph I’d say it’s likely to be about 1987 that the new Duplicate Number flags start) and picking up steam as The Reveal unfolds. Mexico is also interesting in that the thermometer Die Off starts early in about 1980. We saw in another posting that the Mexican thermometers tended to move from the colder more volatile mountains into the more tropical Megathermal Zone and back a little ways from the oceans. Great data, thanks very much. You are most welcome. I’ve added some updates for Mexico and Puerto Rico and a wonderful example of stability in yet another French Island: Saint Pierre & Miquelon Island. So you will probably want to take another look at the graphs. You can compare the Mod Flag zero of a kept to a tossed all day and find nothing. This sentence looks pretty strange. “Kept to a tossed”? @Jeff Alberts: I’ll clarify it when I get a chance. It’s a reference to all the folks doing “Hypothetical Cow” arguments about how all the “dropped” stations trends match all the “kept” stations trends, so there can be no impact from the dropping. What they miss in that reasoning is that The Splice changes the trend after the common point in time of the “kept” station and The Reveal is about unmasking a divergent trend in a box anywhere up to 1200 km away that may in turn be based on in-fill data from up to a further 1000 km away from the dropped (or “tossed”) station. So I’d finally decided that with the persistent 1990 “Hockey Stick” being the apparent cause of “global warming” via a data Splice; I ought to take a look at MIN and MAX as well just to see if both were showing a hockey stick, or only one of them. This is a sample from the ‘average MAX temperature’ report for Canada. Yeah, that +4.6 C AVERAGE in January in 2007. The AA line at the bottom is the “Average of the Averages” where the Ad line is the “Average of the Data”. So we’re about -7.9 +/- 1 C for the “typical” January. Leading up and leading out we have about -10 to -15 C but THAT year we have a spike? Somehow “I don’t think so” comes to mind. Oddly, the “v2.mean” file that has the monthly mean data in it, seems to have a more valid mean. Chief. I know how busy you are but would you be able to do Australia soon as we need all the help we can get. At present the Rudd Government is under increasing pressure over several very expensive major bungles arising from their poorly targeted and badly administered money-wasting “stimulus package” . Rudd has also opened the illegal immigrant flood-gates and put people smugglers back in business by relaxing previous border restrictions which had slowed illegal boat arrivals to a trickle. It is now costing Australia a fortune. The natural variability “deniers” down here led by our national broadcaster the left-wing dominated ABC and other MSM scribes and organisations, are kindly providing a diversion for Prime Minister Rudd by mounting another intensive daily misinformation and scare campaign about Anthropogenic Global Warming, which of course, whilst denying the influence of most or all of the natural variability factors, they still deviously describe as climate change. reduction in south-west Western Australia. of the highest quality.” Unquote. Of course climate change is always real, be it warming or cooling as has happened naturally since time began. What is still in question is the computer modelling driven theory of Anthropogenic Global Warming. Can you help? REPLY: [ I’ll do what I can. Looking at the “Comma Separated Value” file that I use for making graphs, it looks like you have remarkable stability (at about -1 C compared to today) right up until 1988 or so (when most places start getting the new Duplicate Number / Modification History flags, then The Reveal in 1990 pretty much screws the Roo… and makes a hockey stick out of it. though with the ‘odd twist’ that there is a brief drop in thermometer count then a rise again between the setup of The Trick in 1988 and The Reveal. Here’s the ‘bag of bits’ without the monthly values. Format is Year, dT, dT/yr, ThermometerCount. Never mind, I re-read it a few more times and it made sense. I was putting “kept to a tossed” together as a phrase instead of seeing it as a comparison. I’m going to work up a Pacific Basin “stub” posting with a few of the Pacific countries in it “sometime” after dinner. I’m going to swap directions and instead of getting N.America done before starting the next continent, I’m going to put up “stubs” and add graphs to all of them in parallel. Longer to get any one posting fully “done”, but then as ‘requests’ pop up it’s faster to just ‘make a graph and link it in’. N&S America and Pacific Basin first. Asia, then Europe and Africa to follow. The pattern will be my evaluation of the tables, a “poster child” for each of “Hockey Stick” and “Flat” countries and any other graph that I’ve made as they get made. Plus some fast comments to be refined later. Thanks so much E.M. I’ll get some better brains than mine straight onto it. No doubt about you ! As we say in Aussie, your blood’s worth bottling !! Bermuda had a BIG change in 1995. For years, starting at the beginning of WW2, there was Fort Bell AAF, then Kindly Field, then Kindley AFB, and finally a Naval Air Station. The were all the same place, but in 1995 everything was handed back to Bermuda and it became Bermuda International Airport. I wonder how much connection there might be in the flat temperatures up to 1995? Anyway, I wonder if the temperatures in the Azores followed/tracked along with Bermuda in 1995. OT: I remember flying to the Azores once as a substitute weatherman with a crew piloted by an Australian Exchange pilot on his first trip to Lages. When we landed the Gunner told him to call for a “Bread Truck” to haul all in our stuff — and the crew. This was slang for the blue vans plying the flight line, but I never heard them called anything else. So the pilot called the tower, operated by the Portuguese, and requested a “Biscuit Lorry.” The resulting conversation and confusion had the entire crew in stitches and unable to quickly straighten out the Flight Lt — a really super guy.